Puppies need to eat a diet that is specifically formulated for their unique nutritional needs. Similarly, large breed dogs have their own list of nutritional requirements that differ from those of small breed dogs. The best large breed puppy foods are developed with the fast growth rate and specific nutritional requirements of large breed puppies in mind. When it comes to raising a disease-free and healthy puppy, nutrition is the first thing for a pet owner to focus on. Studies show that large breed dogs are more likely to develop musculoskeletal and orthopedic diseases, arthritis and other joint problems. Based on recent research of these disorders (source), veterinarians and companies have developed special puppy food brands designed for large breeds to prevent these health issues. * Click on the best large breed puppy foods for more information, prices and details. Scroll below to read reviews. Remember that no article can replace a consultation with a veterinarian or a certified canine nutritionist. For the best advice on how to feed a large breed puppy (your specific dog), make sure that you consult with a professional dog expert. Many new puppy owners are not aware of just how important it is to choose the right brand of food for their new canine companion. They assume that pet food regulations are strict, and companies can only manufacture quality products that are safe for dogs. Sadly, there are loopholes in pet food regulations that allow manufacturers to include some less than ideal ingredients in the dog food they produce. For example, current regulations DO NOT require meat ingredients to be sourced from USDA inspected and approved slaughtered animals. That means that some meat ingredients could be sourced from 4D (dead, dying, diseased or disabled) animals that have been rejected for use in the human food industry. So, basing your choice of puppy food solely on price or brand recognition could prove to be damaging to your dog's health and well-being. Just because a brand is popular, doesn't mean that it uses healthy ingredients. And, when it comes to price, you typically get what you pay for. If a puppy food brand is a lot cheaper than others, it's probably because the manufacturer used cheaper (less healthy) ingredients. Don't worry. We know it's overwhelming to try to choose the best large breed puppy foods, but we're here to help. While it would be impossible to recommend the absolute best food for any dog without examining it, we've found 12 puppy food brands that offer high-quality nutrition that will meet the needs of most large breed pups. Large breed dogs have unique nutritional needs that differ from those of small and medium dogs. There are many factors that can be affected by poor nutrition in large or giant breeds, the most important crucial is bone growth, and research have demonstrated how this can be significantly influenced by what you feed your large breed pup (study). Studies have also shown that poor nutrition (mostly related to calcium and phosphorus intake) can result in improper skeletal development and diseases in large and giant breeds. While a lot of the research is focused on nutrition for puppies, there are also studies that show nutrition plays a huge role in the overall health and well-being of large breed dogs from puppyhood through their senior years (study). Large breed puppies grow faster than their small- and medium-sized counterparts. This quick growth puts a lot of stress on their skeletal structure and joints, which can result in severe health problems if not addressed with proper nutrition while they are young (study). It is important that the best large breed puppy foods provide enough calories, vitamins and minerals for your young dog, while at the same time have lower levels of other ingredients. This ideal mix of ingredients is what makes large breed dog food recipes different from other formulas. The amount and kind of nutrients your puppy gets needs to match their age, size, breed, activity level and metabolism to avoid health complications as they age. You’re not going to be able to figure this all out on your own. 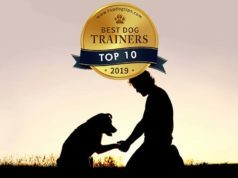 While there are lists like Sarah Ann Taylor's rankings of best puppy food brands, it's generally pretty difficult to formulate a perfect diet of your pooch all on your own. All of these variables make for an extremely complicated process of researching to figure out your dog’s exact nutritional needs and find a food that meets them. Your veterinarian may not even be able to give you the most accurate information on this subject. Most general veterinarians are not experts in canine nutrition specifically. But, they should be able to guide you to better sources. Be sure to speak with your veterinarian or a trained canine nutritionist before switching to one of these best large breed puppy foods. 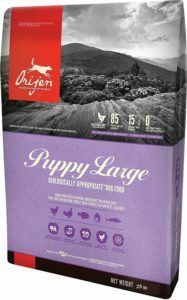 Orijen Puppy Large dry dog food is a grain-free, low-glycemic, and protein-rich formula tailored to the unique needs of large breed puppies. Its 85%-to-15% ratio of poultry, egg, and fish to botanical ingredients emphasizes the need for canine diets to be based mainly on animal protein sources. In fact, the first 15 ingredients are all premium meat and fish (including chicken, turkey and mackerel). And it does not lack of wholesome fruits and super foods like kale, spinach, collard greens, and a whole lot more. Ingredients: Deboned chicken, deboned turkey, yellowtail ﬂounder, whole eggs, whole atlantic mackerel, chicken liver, turkey liver, chicken heart, turkey heart, whole atlantic herring, dehydrated chicken, dehydrated turkey, dehydrated mackerel, dehydrated chicken liver, dehydrated turkey liver, whole green peas, whole navy beans, red lentils, chicken necks, chicken kidney, pinto beans, chickpeas, green lentils, natural chicken ﬂavor, lentil ﬁber, herring oil, ground chicken bone, chicken cartilage, chicken fat, turkey cartilage, dried kelp, freeze-dried chicken liver, freeze-dried turkey liver, whole pumpkin, whole butternut squash, kale, spinach, mustard greens, collard greens, turnip greens, whole carrots, apples, pears, pumpkin seeds, sunﬂower seeds, zinc proteinate, mixed tocopherols (preservative), chicory root, turmeric, sarsaparilla root, althea root, rosehips, juniper berries, dried lactobacillus acidophilus fermentation product, dried biﬁdobacterium animalis fermentation product, dried lactobacillus casei fermentation product. It’s very important for large breed dogs to eat foods that have lower levels of calcium and phosphorous, and Orijen has it in the proper levels (1.1% Ca and 0.9% P) and optimum ratio (1.2:1). Dogs get the added benefit of eating closest to raw because Orijen Large Breed Dry Puppy Food uses freeze-dried and dehydrated ingredients with the nutrients and flavor of raw locked in. It does have a fishy smell, which is understandable due to its flounder, mackerel, and herring ingredients. Aside from the benefits of a diet compatible to the needs of a large breed puppy, this is one of the best large breed puppy foods because it helps in improving poop consistency. The dietary fiber and probiotics in this recipe help maintain healthy guts and excellent stool quality. Orijen is pricey, but dogs love its flavor and are healthier for it. So even that price tag and the stinky smell won’t talk us out of it. Holistic Select formula for large and giant breed puppies is made from lamb meal, chicken meal, oatmeal, brown rice, fruits and vegetables, prebiotic fiber, digestive enzymes, probiotics, and supplemental vitamins and minerals. This dog food places great importance on gut health and regular bowel movement, and we understand why. Around 70% of the immune cells reside along the dog’s digestive system, so ensuring a full-functioning digestive tract results to a strong immune system. The ratio of calcium to phosphorous in Holistic Select is well within what’s recommended as safe, and contains around the same calories (per cup) and fat level as Orijen. Large breed puppies placed on Holistic Select Natural Dry Dog Food for 10-12 months showed moderate but steady growth. Gradual growth is much preferred over rapid growth, because it closely matches the development of their skeletal system, and thus helps reduce the incidence of orthopedic disorders common to large breed dogs. Puppies love the flavor of this recipe and they seem more satisfied after every meal. Their skin and coat often get complimented on and their owners couldn’t be any prouder. Potty sessions have become easier under this diet, too – no more runny stools or painful constipations. Blue Freedom Grain-free chicken recipe with LifeSource bits provides large breed puppies the nutrients they need to grow properly. It is made with chicken, chicken meal, turkey meal, potatoes, egg product, and nutrient-rich high-fiber plant sources like flaxseed, alfalfa meal, blueberries, cranberries, carrots, turmeric, and barley grass. This food from Blue Buffalo also contains sources of essential fatty acids necessary for brain and eye development, probiotics for healthy digestion and immune system, and vitamin and mineral supplements for overall health and functioning. Ingredients: Deboned Chicken, Chicken Meal, Pea Starch, Peas, Potatoes, Chicken Fat (preserved with Mixed Tocopherols and Citric Acid), Turkey Meal, Pea Fiber, Tomato Pomace (source of Lycopene), Flaxseed (source of Omega 3 and 6 Fatty Acids), Natural Chicken Flavor, Alfalfa Meal, Potato Starch, Whole Carrots, Whole Sweet Potatoes, Blueberries, Cranberries, Barley Grass, Dried Parsley, Garlic, Dried Kelp, Taurine, Yucca Schidigera Extract, L-Carnitine, L-Lysine, Glucosamine Hydrochloride, Chondroitin Sulfate, Turmeric, Oil of Rosemary, Dried Chicory Root, Beta Carotene, Vitamin A Supplement, Thiamine Mononitrate (Vitamin B1), Riboflavin (Vitamin B2), Niacin (Vitamin B3), d-Calcium Pantothenate (Vitamin B5), Pyridoxine Hydrochloride (Vitamin B6), Biotin (Vitamin B7), Folic Acid (Vitamin B9), Vitamin B12 Supplement, Calcium Ascorbate (source of Vitamin C), Vitamin D3 Supplement, Vitamin E Supplement, Iron Amino Acid Chelate, Zinc Amino Acid Chelate, Manganese Amino Acid Chelate, Copper Amino Acid Chelate, Choline Chloride, Sodium Selenite, Calcium Iodate, Salt, Caramel, Potassium Chloride, Calcium Carbonate, Dicalcium Phosphate, Dried Yeast (source of Saccharomyces cerevisiae), Dried Lactobacillus acidophilus fermentation product, Dried Bacillus subtilis fermentation product, Dried Enterococcus faecium fermentation product. Blue Freedom Grain Free Puppy Dry Dog Food has appropriate levels of protein, carbohydrates, and fats, and its calcium to phosphorous ratio (1.4:1) is within what’s considered healthy for a large breed dog. Blue Freedom is less calorie-dense or protein-rich than other Blue recipes. It is formulated as such to ensure that dogs get what they require for growing without gaining too much weight too quickly, which increases the risk of developing joint and bone issues in the future. Dogs seem to find interesting the mixture of triangular brown kibbles and smaller dark LifeSource balls. We like the idea that they were cold-formed and thus more nutritious sources of antioxidants and other nutrients. Many dogs love this recipe, while some don’t. If your puppy happens to like it, then you’re in luck because it’s very reasonably priced. This recipe from Fromm Family Foods for large breed puppies is made with a variety of protein sources, such as duck, chicken, lamb, and dried whole eggs. It also contains oatmeal, barley, brown rice, potatoes, flaxseed, lettuce, vitamins, minerals, prebiotic fiber, and probiotics. Its protein and fat contents are within healthy levels, which are important to watch out for because of the risk of developmental joint diseases associated with large breed dogs. The kibbles are slightly large which we find perfect for large breed puppies. This size encourages chewing, which is necessary for dental health. Dogs display great energy in their activities while also showing well-toned muscles and perfect weight. With Fromm Family Foods Gold Nutritionals Dog Food, it’s actually easier to control the puppies’ weight at ideal levels because of the lower calorie count per cup. This is an expensive brand, second only to Orijen, but it’s worth every cent. Gorgeous fur and healthy skin are just a few of the bonuses that it comes with, and you’d also notice smaller and firmer poop. This indicates that the nutrients in this dog food are very well-absorbed and utilized by your dog, with just the right amount of insoluble fiber to produce firm stools. 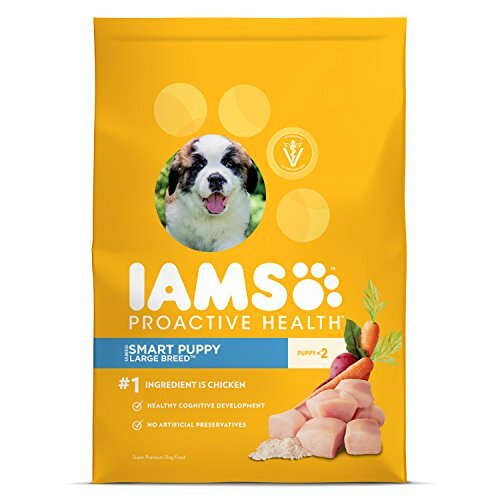 Chicken is the main protein source and first ingredient of Iams Proactive Healthy Puppy large breed dog food. This formula contains 26% crude protein critical for growth and for building strong muscles. It also contains wholesome whole-grain corn and sorghum, which provide energy, natural vitamins and minerals, and a good balance of soluble and insoluble fibers. It is enriched with vitamins, minerals, and antioxidants to ensure proper body functions and healthy immune system. Buyers say this is one of the best large breed puppy foods, because their pup preferred it over their previous brand. Their owners noticed that the kibbles of Iams Proactive Health Puppy Dry Dog Food are softer and gentler on baby teeth. The sizes of the pieces are also more consistent than other brands they’ve tried. The puppies that used to have dull rough hair showed great improvement. They now sport enviably silky coats. While their appetites have improved, they seem to feel full quicker. 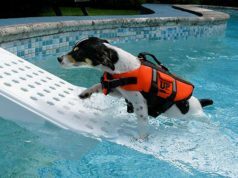 With that, you don’t need to feed them too much or sweat over keeping your dog’s weight at the ideal mark. Instinct Raw Boost chicken recipe for large breed puppies contains the same double-treat that the other Instinct Raw Boost formulas have – crunchy nutrient-rich kibbles and tender freeze-dried raw meaty pieces. This special formula is made with chicken, turkey meal, lamb meal, flaxseed, kelp, blueberries, apples, and other natural sources of vitamins, minerals, antioxidants and essential fatty acids. This blend from Nature's Variety has very much the same formulation as the original Instinct formula, except that it has glucosamine and chondroitin added to it to ensure healthy joints. It also has natural sources of DHA for proper brain and eye development. This is a premium dog food in the same price category as Orijen (price per pound). It has high protein and calorie content. Just like Orijen, it is also grain-free and made from a variety of animal protein sources. Dogs love the taste and texture Instinct Raw Boost Grain Free Recipe Natural Dry Dog Food by Nature's Variety offers, but they are clearly more enthusiastic about the freeze-dried bits than the kibbles. In fact, they make a mess of their food looking for the light-colored bits. They do eat the kibbles but only after finishing with the raw pieces. Overall, dogs very well in this formula as can be seen from excellent bone structure, lean muscles, and perfect coat. This premium food has a premium price tag naturally. That’s the only downside actually, but pet owners (and their puppies, too) wouldn’t mind that so much if the ratio between kibbles and raw pieces were consistent. As it is, you may chance upon a bag with just a few raw bits if it’s your unlucky day. Just better quality control in that aspect would actually put this dog food higher up on our list. 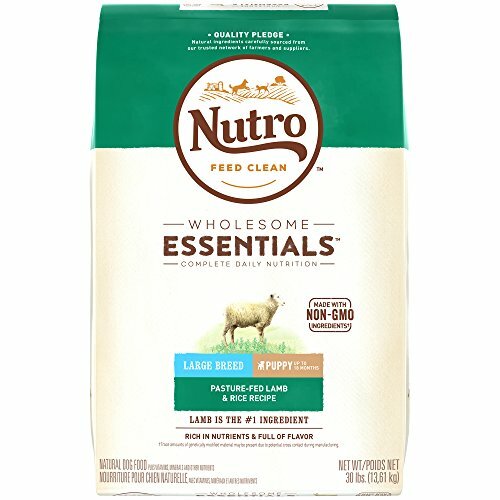 Nutro Wholesome Essentials abides by its “Feed clean” standard and doesn’t contain genetically-modified ingredients, chicken by-product meal, soy, corn, wheat, and artificial color, flavor, or preservatives. What it contains instead are lamb meat, lamb meal, rice, peas, oatmeal, sunflower oil, fish oil, and other wholesome ingredients. Whole grains and rice bran provide roughage necessary for producing firm stools. This is one of the best large breed puppy foods, as it has vitamin supplements and chelated minerals to ensure that puppies get all the nutrients they need for growing up. Puppies love the full flavor of this real lamb formula and their owners are happy that they’re feeding their fur babies clean and nutritious food. It comes at a very affordable price, too, which makes it really attractive to the budget-conscious. Nutro Wholesome Essentials Puppy Dry Dog Food is not a grain-free dog food but uses wholesome grains instead which are good sources of natural vitamins, energy and dietary fiber. Nutro Wholesome Essentials has moderate levels of protein and calories, which is what your large breed puppies must be getting from their food. This makes it possible for them to attain their ideal weight gradually without unnecessarily straining their young bones and joints too much. Give your puppies this deep-flavored meal that’s rich in protein and other nutrients necessary for a puppy’s active life and high-growth period. These best large breed puppy foods from CANIDAE are made with chicken and lamb meat, ocean white fish and eggs. It’s enriched with supplemental vitamin and chelated minerals (more easily absorbed than non-chelated) for well-balanced nutrition. This contains no soy, corn, wheat, hormones, or artificial color, flavor, and preservatives. You get the greatest bang for your money with this canned food. Each can contains all ground meat, which is moist but not soupy as you would often see in most canned wet dog food. That means you get what you’re paying for, which is the meat not the liquid. Puppies are happiest with this great-tasting high-protein food. Some pet owners mix CANIDAE Life Stages Canned Dog Food for Puppies with Canidae dry kibbles, and it definitely adds zest to every bowl. Puppies’ stools are firmer and smaller (few and far between, too), which could only indicate that they are digesting their food so well and absorbing the nutrients instead of expelling their food as waste. Feeding is so much easier with this multi-stage dog food, and this is a huge help for households with dogs of various life stages. Hill's Science Diet Chicken Meal & Oats Recipe for large breed puppies is backed up by scientific research and clinical trials to ensure that it’s the perfect formula for this category of dogs. It has adequate levels of calories and protein to fuel large breed puppies’ growth and energy needs, and controlled ratio of calcium and phosphorous to support a healthy skeletal system. Its ingredients include chicken meal and whole grains of wheat, oats, sorghum and corn. It also contains fruits, vegetables, oils, and nutrient supplements. The kibbles are medium-sized cubes which puppies like to take crunchy chomps on before swallowing. This is healthier for their teeth and gums. Chewing also makes puppies eat so much slower, which is good because they’ll feel fuller with a lesser amount of food. Other pet owners tried soaking the kibbles of Hill's Science Diet Large Breed Dry Dog Food in broth and water and that, too, worked for their fur babies. Puppies that frequently had digestive problems responded positively to Science Diet. Gone were the runny stools and gas. Their bowel movement has also become more regular. They are in great shape, more active, and have shiny coats. The price of this recipe went up a bit but packaging has also improved (comes in well-sealed box), so the cost is still pretty reasonable overall. The first three ingredients of Wellness Core are chicken, chicken meal, and turkey meal, which are all high-quality sources of protein. It also contains peas, potatoes, flaxseed, salmon oil, tomato pomace, spinach, and fruits like blueberries and apples which are rich in natural nutrients and antioxidants. Vitamin and mineral supplements were added for good measure. This formula is free from grains, meat by-products, wheat, corn, soy, and artificial colors, flavors or preservatives. Wellness Core Natural Grain Free Dry Dog Food is among the formulas with the highest protein and calorie count in this list. This will be ideal for highly athletic large breed puppies or those that have not been hitting their ideal weight marks based on age and breed. For normally growing puppies (with typical physical activities), though, they should be fed with food that is not as calorie-rich or protein-dense. The best thing about this formula is that it is not stuffed with fillers, thus is more satisfying for dogs. The key with all of the best large breed puppy foods is not to overfeed. With this brand, buyers say their dogs' poops are small and firm, which attest to Core’s high digestibility and good quality. This is one of the best large breed puppy foods, as it is a wholesome dog food formulated for a steady but longer growth period. Its key ingredients are chicken, salmon, and brown rice, which provide well-proportioned levels of protein and carbohydrates. This recipe from Wellness Natural Pet Foods also contains fruits, vegetables, and salmon oil that provide natural sources of nutrients, antioxidants, and essential fatty acids. A good amount of prebiotic fiber and probiotics are present to ensure healthy digestive and immune systems. Vitamin and mineral supplements were added, too, to make sure that your puppy gets all the nutrients it needs to grow and develop properly. Ingredients: Deboned Chicken, Chicken Meal, Peas, Ground Brown Rice, Salmon Meal, Oatmeal, Barley, Oats, Tomato Pomace, Chicken Fat (preserved with Mixed Tocopherols), Ground Flaxseed, Tomatoes, Salmon Oil, Carrots, Natural Chicken Flavor, Salt, Choline Chloride, Spinach, Vitamin E Supplement, Chicory Root Extract, Yucca Shidigera Extract, Taurine, Zinc Proteinate, Mixed Tocopherols added to preserve freshness, Sweet Potatoes, Apples, Blueberries, Zinc Sulfate, Calcium Carbonate, Niacin, Ferrous Sulfate, Iron Proteinate, Vitamin A Supplement, Ascorbic Acid (Vitamin C), Copper Sulfate, Thiamine Mononitrate, Copper Proteinate, Manganese Proteinate, Manganese Sulfate, d-Calcium Pantothenate, Sodium Selenite, Pyridoxine Hydrochloride, Riboflavin, Garlic Powder, Vitamin D3 Supplement, Biotin, Calcium Iodate, Vitamin B12 Supplement, Folic Acid, Dried Lactobacillus plantarum Fermentation Product, Dried Enterococcus faecium Fermentation Product, Dried Lactobacillus casei Fermentation Product, Dried Lactobacillus acidophilus Fermentation Product, Rosemary Extract, Green Tea Extract, Spearmint Extract. This is a naturally preserved product. This dog food has the lowest fat level among the formulas in this list. You’d want that, especially if your dog tends to overeat or gain more weight than is ideal. Wellness Complete Health Natural Dry Large Breed Puppy Food also contains optimum levels and ratio of omega 3 and 6, which promote healthy skin and coat. This large breed recipe from Wellness comes highly recommended by veterinarians. The ingredients are so wholesome that even holistic practitioners approve of them. This is not grain-free (there’s another recipe that is) but the grains it includes are nutritious and easily digestible. Puppies show so much enthusiasm eating this, so it’s safe to say that it must be flavorful, too. Blue Wilderness Rocky Mountain puppy food from Blue Buffalo does not say that it’s specifically formulated for large breed puppies. A quick check of its nutritional content shows high protein, calorie, and fat levels, but not as high as with Orijen (in number 1) or Instinct Raw (in number 6), which are both large breed puppy specific formulas. Its calcium and protein ratio is within what’s considered safe for this puppy category and it’s made with high-quality ingredients, with no grains or poultry by-products. Its well-balanced nutrients are sourced from beef, chicken meal, turkey meal, bison, venison, lamb, egg, chicken fat, flaxseed, fish oil, tomato pomace, antioxidant-rich fruits and vegetables, fermentation extracts, and vitamin and mineral supplements. Transitioning may cause a couple of loose stools, but once fully transitioned to Blue Wilderness Rocky Mountain Recipe High Protein Grain Free Puppy Dry Dog Food, puppies become regular with firm and easy-to-pick-up poop. With this result, you may now start looking forward to potty training – which shouldn’t be that intimidating anymore. Dogs are happy with this food and seem to really like it. Remember though that this is calorie-dense, so take heed of proper food measurement. The kibbles are easy to chew. Some dogs skip around the small dark LifeSource bits, but those are the antioxidant-rich pieces and it would be great if you could find a way to make your dog eat them. Just a head up – the red meat may give your dog a red beard, so don’t be alarmed seeing it for the first time.